See what I have to work with? (And for the record, it’s impossible for anyone to get tired of chicken. I certainly don’t- and therefore, it’s impossible). But sometimes, I will get a very specific request to make something someone has a craving or hankering for. For my twin sister, Jasmine, it’s usually for baked spaghetti (she could eat that stuff every day). My mom really likes fried chicken. 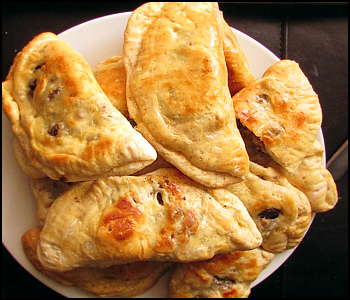 My older sister Ashley really likes these meat pies. Truth to be told, she’s been asking me to make her some of these for a long while now. The problem is, the last couple of times I made meat pies, I didn’t make them to her satisfaction. See, being the foodie that I am, I like to experiment with different flavor combinations and various fillings for savory pies. I’ve got dozens of recipes for pies and empanadas that I still have to try out: spicy Caribbean with curry powder and sweet potato, French Canadian with cinnamon and cloves, southwestern with salsa and corn…the possibilities are endless. But Ashley doesn’t go for all that. She likes to keep her meat pies simple. And by simple, I mean that the only thing she likes in her meat pies is meat. Nothing else. Yeah, I know. Weird. 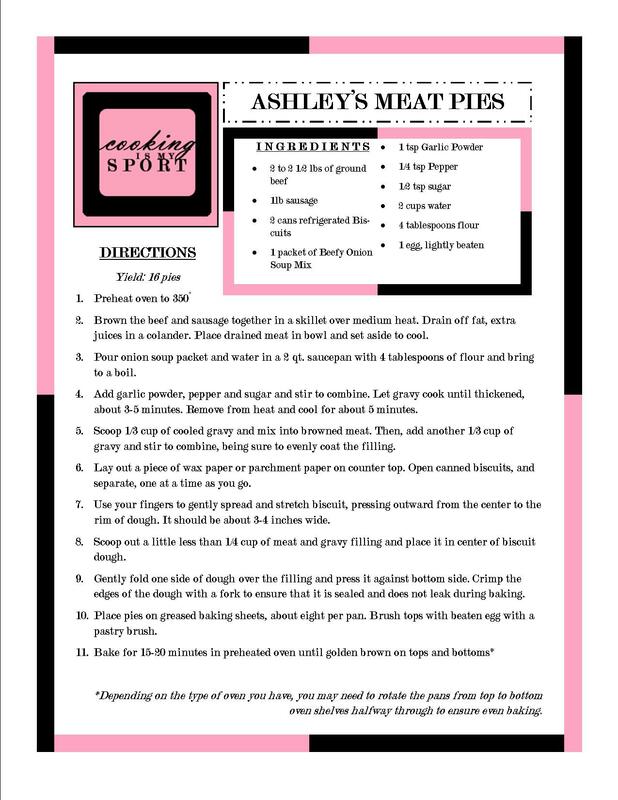 Well, I’m a good sport and I generally like to give people what they want (where cooking is involved anyway), so I decided to put aside all of my great genius of culinary creativity and make Ashley her meat pies the way that she wanted them. The only ‘challenge’ I saw with a recipe like this is making sure that even though the ingredients are sparse, they still have flavor. Because as versatile as ground beef can be, it can still turn out pretty bland- especially without any powerful spices to give it some character. Since I was essentially only working with a ‘beef’ flavor, I decided to just bump it up a few notches. That ‘bump’ mainly came from a packet of Beefy Onion Soup Mix. 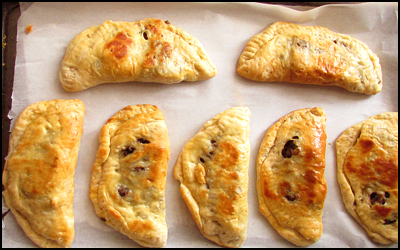 It enhanced the flavor of the meat, while also giving it some moisture so it wasn’t dried out inside the pastry after baking. 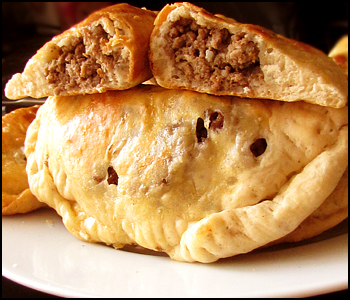 These meat pies are pretty easy to make, not just because of the simplicity of the filling, but also because the ‘pastry’ is really just canned biscuits that I stretched out with my hands, then folded together. I know, I’m cheating. But I had other things to cook that day, and needed something in a quick fix that would still taste good. I’m not afraid of making my own pie crust, but if you are, then the biscuits in this recipe are an easy and just as delicious alternative. I went with Pillsbury Grand’s Southern Biscuits. Word of advice though: do NOT use any Flaky kinds. Flaky biscuits puff up and separate while baking, and while this is fine eating them on their own, it doesn’t work well for meat pies. You want them to stay together. That’s the whole point. Traditional meat pies in Australia and the UK are typically served with ketchup on the side for dipping. These would probably taste fine that way, but I also think that barbecue sauce or A1 steak sauce would be pretty tasty. I just served them with the leftover gravy I had from the filling, and they got the thumbs up from Ashley. But you can serve/eat yours however you want. It’s your world. FEED(ME)BACK: What special dishes do you make for your loved ones? 2. Brown the beef and sausage together in a skillet over medium heat. Drain off fat, extra juices in a colander. Place drained meat in bowl and set aside to cool. 3. Pour onion soup packet and water in a 2 qt. saucepan with 4 tablespoons of flour and bring to a boil. 4. Add garlic powder, pepper and sugar and stir to combine. Let gravy cook until thickened, about 3-5 minutes. Remove from heat and cool for about 5 minutes. 5. Scoop 1/3 cup of cooled gravy and mix into browned meat. Then, add another 1/3 cup of gravy and stir to combine, being sure to evenly coat the filling. 6. Lay out a piece of wax paper or parchment paper on counter top. Open canned biscuits, and separate, one at a time as you go. 7. Use your fingers to gently spread and stretch biscuit, pressing outward from the center to the rim of dough. It should be about 3-4 inches wide. 8. Scoop out a little less than 1/4 cup of meat and gravy filling and place it in center of biscuit dough. 9. Gently fold one side of dough over the filling and press it against bottom side. 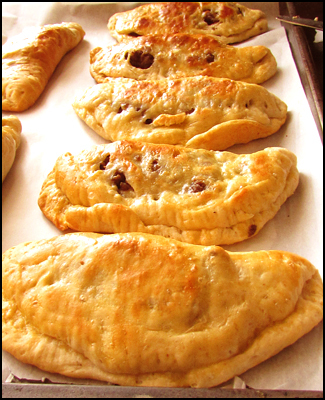 Crimp the edges of the dough with a fork to ensure that it is sealed and does not leak during baking. 10. Place pies on greased baking sheets, about eight per pan. Brush tops with beaten egg with a pastry brush. *Depending on the type of oven you have, you may need to rotate the pans from top to bottom oven shelves halfway through to ensure even baking.